wresting the crown back from jasper? Home Page | Big Red Diary | 2013 | October | wresting the crown back from jasper? I spotted a fantastic new book while I was doing the vendanges, not cheap at €69 in Athenaeum in Beaune, but once the pages are thumbed you are (I was!) compelled to buy. 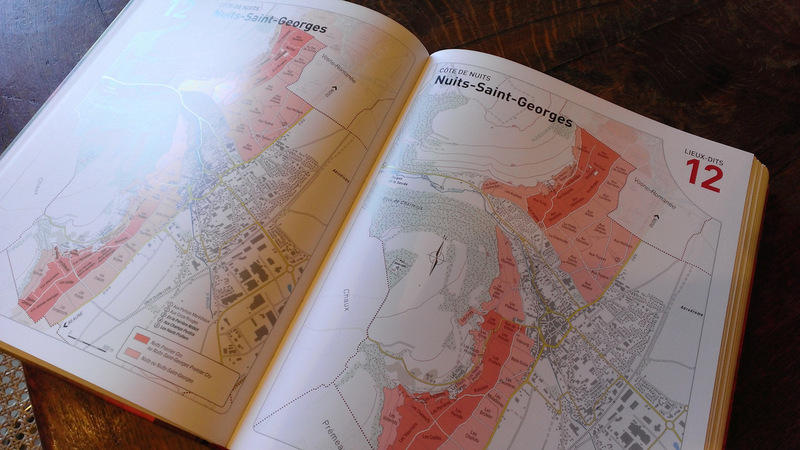 Let’s be clear, it’s in French, but who cares with such wonderful new maps from Sylvain Pitiot – but wait, how can they have made such a mistake with such a beautifully presented (and expensive) book? There are two maps of Gevrey-Chambertin! Indeed there turns out to be two maps of most communes! Eventually the penny drops; one map is for the climats of that village e.g. Chapelle-Chambertin, the other is for the lieu-dits e.g. Gemeaux! Ooh! now that’s useful. There are also tables that define each climat (village lieu-dits too) to 4 decimal places (hectares) and list (for instance) exactly which lieu-dits make up Fixin’s Clos de Perrières. Add to that a list of the producers (almost, there is an occasional ‘missing’) who declared a particular Grand Cru in 2011 and this is a pretty terrific reference work. PS Sorry about the site being down yesterday – but my hosting company (it was them not me) didn’t feel the need to rush into doing anything remedial, after-all, it was only MIA for about 18 hours and nothing moves in Switzerland on a Sunday…! Where can I buy the book. I don’t care if it is in French. I’ll have Paul Wasserman to translate it for me. Much more Wolfgang – let me know what you think. Hi Bill, as you say a great book following on from the Atlas des Grands Vignobles de Bourgogne by Pitiot et Poupon, which even with the second edition (Nouvel) was getting a bit dated. That said it still does not capture all of what could be termed alternative Climat that one finds on a label. Do you have details of the companion work I would need to get that! US customers may do better buying the book out of amazon.co.uk — at least that worked for me two years ago when I purchased the book. I guess I must have bought it last fall, Bill. I recall commenting to Sylvain on it when I visited at Clos de Tart and it seemed like two visits ago, but I guess it was the most recent one. Nevertheless, the possible favorability of price from amazon.co.uk for US customers still stands. Just got this from Amazon in UK – £52 but net £2 to me as I’d got a daft ‘recognition’ award thing from my employer, convertible to high street vouchers, with Amazon one of the options. Only had a quick leaf through so far – looking at the ‘pictures’ – well, the maps 🙂 . Irresistibly drawn to Morey first, can’t think why ;- ) . First impressions look’s a superb addition to the ole library and likely to be my ‘go to’ reference work me thinks. Thanks for the article Bill, likely would have missed otherwise.